crosses Eiger, Mönch, Jungfrau and sets new speed record! Mario Heller climbed all three summits in ten hours and 14 minutes. In an interview with the Jungfraau Zeitung, the 30-year-old explains how he prepared himself and how the experience was. Mario Heller set a new speed record for the Eiger, Mönch and Jungfrau on 20th August. 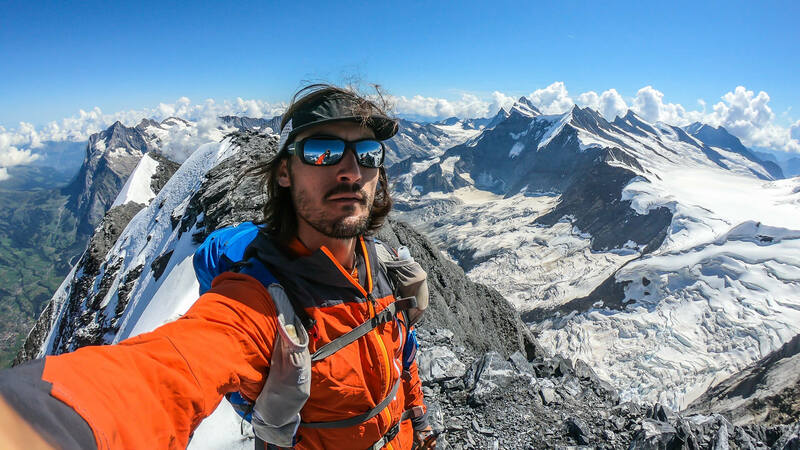 The 30-year-old climbed all the peaks in just ten hours and 14 minutes. Originally from Lucerne, know living in Matten, Mario beat the previous record of Nicolas Hojac by more than one and a half hours. "It's fun," says Heller, who works as an Outdoor Interlaken Canyoning Guide. "I'm proud and trained well in advance." In preparation, he had been waiting for the right weather conditions. "I do a lot of paragliding in the mountains and took part in the Eiger Ultra Trail last year." He completed the route on foot and by paraglider. The idea for the record attempt came from Hojac's action in 2017, as Heller recounts. "I saw that last summer and found it exciting. It was such a cool thing to do. Since I know all three summits, it was logical to put them together in one go." The decisive factor for this attempt was the weather. «Nicolas could not start on the Mönch with a paraglider and lost a lot of time there. He probably tried a long time and finally had to dismount. I did not have it easy on the Mönch either. "The rest of the peaks were completed in a similar time - for example, both had been on the summit of the Jungfrau in five hours. The hardest part of the mission was the Eiger. "It was difficult to start on the west flank. In addition, I was getting tired. I needed a good, constant updraft to be able to control the glider well when launching. There were many loose stones and it was difficult to lay out the glider well." As Mario relates, a colleague of his already tried to break his record. "He tried it the following day. But he had wind problems on the western flank of the Eiger and finally completed the course in eleven hours. "I have not planned any similar projects at the moment," says Mario. "But the mountain range is not finished after Eiger, Mönch and Jungfrau," he laughs. "You could just add more peaks." Next week, he's planning another climb - but he's not about speed this time.